For about two decades researchers, politicians, diplomats, and policy makers have been attempting to identify a formula that would achieve a peaceful solution to the Nagorno-Karabakh conflict between neighboring Armenia and Azerbaijan. Because political leaders in both Yerevan and Baku put little or no effort into contributing to a useful solution, none of the formulas proves to be effective enough to bring long-awaited peace and stability. As a result of increasing disappointment in national governments and international organizations that have failed to bring any feasible results, attention is slowly turning to the youth of both countries. In the past, few steps have been taken to engage youth activists in the negotiation process. But now, with a growing access to social media tools, youth in the two countries have more opportunities to reach out to each other. However, they have yet to overcome a major obstacle — a lack of democracy. 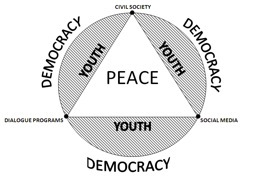 This paper is an attempt to analyze and draw connections between three peace building tools — conflict resolution programs, social media, and civil society, where youth is identified as a driving force (a connecting line between the dots), democracy as an essential environment (a political background), and peace as an ultimate goal (see Image 1). Based on interviews with young men and women from Armenia and Azerbaijan as well as the analyses of materials and data available on the Internet, the paper identifies the strengths and weaknesses of the existing tools. Although there are no concrete or up-to-date figures available, rough estimations indicate that the youth make up about 29 percent (900,000 people aged 18-30) of Armenian and 31 percent (2,800,000 people aged 18-29) of Azerbaijani populations. Considering these figures, the youth in both countries can be used as a driving force in conflict resolution and peace building processes. Yet Armenian and Azerbaijani youth are politically underrepresented, poorly educated, and economically vulnerable. This makes them an easy target for propagandistic and nationalistic ideology that fuels mutual hatred and the enemy image, where young people can be used in escalating violence should military operations resume anytime soon. Gurban Karimbayli, an Azerbaijani youth worker with five years of experience in conflict resolution and cross-national programs, considers that the majority of young people in Armenia and Azerbaijan have an intense desire to peacefully solve the conflict. But, unfortunately, wrong policies enforced by the governments and lack of field specialists in the Nagorno-Karabakh conflict resolution create barriers for that. This opinion has been argued by Rashadat Akhundov, an Azerbaijani youth activist advocating for democracy and human rights, who expresses somewhat pessimistic concerns. According to him, if one considers the current political situation in Armenia and Azerbaijan, it is unlikely that young people can bring any substantial changes or contribute in any way to conflict resolution. To achieve any changes, the youth should be empowered and the political situation should change. Sona Dilanyan, a blogger and youth activist from Armenia who currently studies in the United States, brings a more balanced and ambivalent attitude. She thinks that on the one hand the younger generation is not a direct victim of the conflict in contrast to the older generation that has personally experienced the war consequences, while on the other hand the younger generation is largely affected by the state propaganda and negative stereotypes. So, her general insight is that the term “youth” has been generalized, as in both countries there are young people with radically different opinions ranging from violent nationalists to those inclining towards a peaceful dialogue. Recently there were a growing number of articles, blog posts, and academic papers discussing the role of social media and networks in the Nagorno-Karabakh conflict resolution. As more young people in Armenia and Azerbaijan adapt to social media websites, e.g. Twitter, Facebook, YouTube, and Blogger, more opportunities become available to bypass traditional media that promotes government propaganda on both sides. While the old media is still very popular in the two countries, especially among the adult generation, with the emergence of social media the governments can no longer prevent the spread of ideas that oppose government policies. This eventually leads to the increase of people-to-people contacts on a virtual level between Armenians and Azerbaijanis. Veronika Aghajanyan, an Armenian blogger and peace advocate, believes that social media gives everyone a chance to start the peace building process from the grassroots level. She provides two examples — Caucasus Edition and Neutral Zone — that initially sounded like utopian ideas, but with a strong commitment and contributions from Armenians and Azerbaijanis, the websites gained significant traffic for its kind. Social media and networks are also battlefields between peace advocates opposed to those supporting the war rhetoric. Currently, both Armenian and Azerbaijani governments take advantage of social media as well. Through a circle of both authentic and fake accounts on Facebook, Twitter, YouTube, and its Russian alternatives, they promote a type of content that supports the established opinion of political elites about the conflict. Unfortunately, today this content has a wider audience and attracts more interest than the one featuring peace. Moreover, political regimes recognize the threats imposed by the increasing popularization of social media and, thus, closely monitor all political activities online. This is especially true for Azerbaijan, where representation and advocacy activities carried out by bloggers and youth activists ended up with a series of persecutions based on trumped-up charges and sham trials. Any activism on social networks in Armenia and Azerbaijan that contradicts with traditional political ideology and views is a challenging and risky business that makes enemies with one’s own government. While social media is not a panacea for such a painful problem like the Nagorno-Karabakh conflict, it should be critically perceived and used only as a tool to accomplish more ambitious and challenging goals within the conflict resolution and peace building processes. Nevertheless, the potential benefits of social media in conflict resolution are tremendous, especially considering informational and communication barriers between the two countries. The number of conflict resolution and dialogue programs experienced an increase in past years. This happened mainly because of the fact that the United States and the European Union realized the importance of stability in the South Caucasus that would otherwise jeopardize geopolitical and energy security. It was due to these programs that the information and communication control mechanisms used by Armenian and Azerbaijani governments to maintain the status quo were eventually overcome. Encouraging and promoting better and stronger publicity of the existing programs and initiatives not only in English and Russian, but also in Armenian and Azerbaijani languages. Civil society composed of various NGOs and civic initiatives plays a major role in bringing democratic changes in Armenia and Azerbaijan. As identified by the interviewees, a strong civil society must challenge the government to take the right, transparent, and timely actions. Otherwise, it will be hard to imagine that young men and women in both countries will actively engage in conflict resolution and peace building activities. Having a truly independent civil society is an essential element of peace, without which it can merely succeed or survive in the long run. Even if the two governments sign a peace agreement, eventually in the absence of a civil society and lack of trust for political elites, the conflicting sides may again engage in violent actions against each other. Civil society development in both Armenia and Azerbaijan is a fundamental prerequisite for any peace between the two. Civil society is another tool that allows the youth to challenge political regimes in Baku and Yerevan to take effective steps towards peaceful resolution of the conflict. In the current state of affairs, however, civil society both in Armenia and Azerbaijan experiences problems mainly due to the fact that the approach of the authorities towards the concept of civic activism is very corrupt, antagonistic, and politicized. As a result, every new attempt to strengthen civil society and its elements is echoed by democracy setbacks. These include new laws restricting and limiting the activities of CSOs, crackdowns on youth organizations and international NGOs, and compromising black PR campaigns in traditional media outlets. Within the realms of Armenian and Azerbaijani politics, civic activism as an integral part of civil society does not provide a complete cure to the problem. Like social media and dialogue programs, it is just another tool that works best in combination with the first two. Hopefully, if the peace building ideas inspired by various conflict resolution and dialogue programs eventually prevail over war rhetoric on social media, these trends can be reflected in various civic activism forms like boycotts, protests, political flashmobs, and other types of disobedience, forcing the two governments to come to a peaceful agreement. But again, the role of civil society should be neither exaggerated nor underestimated by conflict mediators and peace advocates. Despite the optimistic vision, in reality, during nearly two decades after the collapse of the Soviet Union, civil society has not achieved any substantial results in forcing political regimes towards democratic changes and peaceful resolution of the Nagorno-Karabakh conflict. The destructive role of the political regimes in building their defense walls against a truly independent and democratic civil society should not be disregarded. Exactly as it happened with social media, where the governments acquired this tool to serve their own benefit and counterstrike on any dissent initiatives, today both Armenian and Azerbaijani governments develop their own loyal CSOs that take over the scene of civic activism. Gurban Karimbayli also shares concerns about the challenges that civil society faces in Azerbaijan. He cites the 2010 national budget allocations for civil society development in Azerbaijan in the amount of nearly $3,800,000, which stands for 0.03 percent of the $14,640,000,000 budget. In Hungary, where the national budget totals $63,660,000,000, allocations for civil society amount to 1.01 percent ($700,000,000). Surprisingly, regardless of nationality and political preferences, all interviewees agreed that peace in the Nagorno-Karabakh conflict cannot and will not be achieved without democratic changes in Armenia and Azerbaijan. And even if the peace agreement gets signed by political leaders, the fate and endurance of such a peace are highly fragile, questionable, and dubious. Indeed, only in a truly democratic environment can the formula for a peaceful resolution of the Nagorno-Karabakh conflict be fully enforced in practice. In this case all three tools — conflict resolution and dialogue programs, social media, and civil society — will stand at the disposal of young men and women from Armenia and Azerbaijan. In the political atmosphere where Azerbaijani and Armenian citizens are afraid of and distrust their own governments, it is hard to imagine any Armenian peacefully living and engaging with Azerbaijani authorities. Likewise, it is impossible for any Azerbaijani to go back and interact with the Armenian government. In early November 2011, Facebook users from Armenia and Azerbaijan were asked a question: “What is the most effective solution for the Nagorno-Karabakh conflict?” Table 1 demonstrates that both societies are divided between peace and war. While Facebook is not the perfect and appropriate tool to conduct a survey, it allows for spotting young men and women who support the peaceful resolution of the Nagorno-Karabakh conflict. Moreover, 6.19 percent of respondents expressed the belief that a regional integration, i.e., establishment of a political union in the South Caucasus, can solve the Nagorno-Karabakh conflict. An analysis of their profiles, in terms of education, professional, and political backgrounds, gives the interesting image of a young person aged 18-30, educated in the West, active in civil society, speaking good English in addition to other foreign languages, having one or more friends in the opposed country, being adept in social media, and opposed to his/her government. This small group has the right vision for the future of their countries. They should be further empowered and motivated as they possess qualities that permit them to exemplify the true values of peace and democracy. The youth must be a driving force for positive change and not a tool in the hands of corrupted regimes. The last two decades proved that the political leaders in government and those in classical opposition (formerly running Armenia and Azerbaijan in early 1990s) do not have the political will and desire to solve the conflict. The whole concept of peaceful negotiations was abused so much that it is unlikely that people will trust any “constructive” solutions offered by the two regimes. Furthermore, in a challenging political environment characterized by corruption, growing militarization, and lack of democracy, there are serious concerns that a ceasefire between the two might eventually turn into another armed conflict with far more devastating consequences than the first war of 1988-1994.
interesting post...one thing is missing: the role of women. How come you did not look into that group which has been neglected in peace negotiations both on governmental level and civil society.